One of professional wrestling’s attractions is that it offers something for everyone. Looking for skilled technicians? Wrestling has boasted some of the world’s premier amateur wrestlers. Looking for high-flyers who could work as acrobats and gymnasts? Wrestling has provided gravity-defying artists to keep fans on the edge of their seats. Want to see a larger-than-life worker who define the word spectacle? 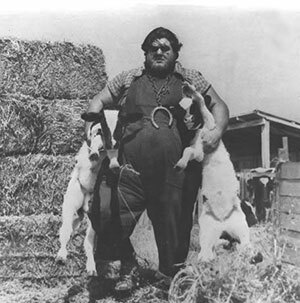 Look no further than Haystacks Calhoun, one of wrestling’s most successful big men. At 6’6” tall and a quarter ton of mass, Calhoun provided promoters with a top draw wherever he worked. “Haystacks” wowed audiences with his size, strength, and remarkable display of wrestling skills for a man his size. He cultivated a character of a lovable hillbilly with his overalls, bushy hair, and trademark lucky horseshoe. Calhoun was a top star in the 50’s, 60’s, and 70’s until weight-related issues took their toll on his health, leading to his death at age 55. Haystacks Calhoun cultivated the character of a lovable hillbilly with his overalls, bushy hair, and trademark lucky horseshoe. On August 4, 1934, William Calhoun entered the world by way of McKinney, TX. 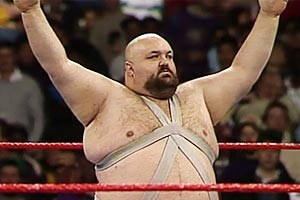 Legend has it the big man was discovered by a group of wrestling promoters who saw him carrying cows across his farm. Whether or not this is true, Calhoun began wrestling in the mid-1950’s, wearing overalls and carrying his lucky horseshoe to the ring. Calhoun boasted a weight ranging from 450-500 pounds – and in true wrestling fashion, his weight would be exaggerated to 600+ pounds depending on where he was working at the time. Billed from Morgan’s Corner, Arkansas, Calhoun furthered the role of a giant hillbilly, thanks to his bushy hair and beard, and habit of wrestling barefoot. While it’s possible Haystacks could have got by on his size alone, the man mountain showed a willingness to learn wrestling holds, displaying rarely seen moves for a man his size. Calhoun displayed remarkable agility as well, making him much more than just a mass of muscle. 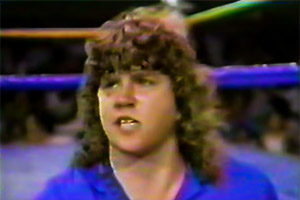 Calhoun never lacked for work, traveling the globe to work in a number of National Wrestling Alliance territories, earning NWA World Heavyweight Championship title shots. 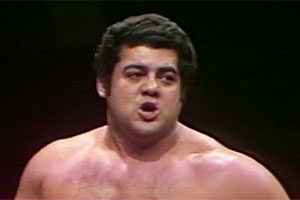 Through the years, Calhoun also visited New Japan Pro Wrestling and Vince McMahon Sr.’s World-Wide Wrestling Federation. The big man could also be found on television, such as his cameo in Rod Serling’s television production of Requiem for a Heavyweight. Haystacks signing autographs for fans at the Fairgrounds Expo Building in Walla Walla, WA. June 14, 1963. He made frequent appearances on television including Groucho Marx’ show You Bet Your Life and talk shows hosted by Jack Parr and Merv Griffin. Calhoun dazzled viewers with his incredible strength when he appeared on Art Linkletter’s program House Party. There, Calhoun tossed bales of hay like they were rolls of toilet paper. Needless to say, the nickname “Haystacks” was forever attached to Calhoun. 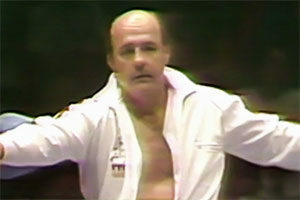 Calhoun’s wandering ways ended when he settled down in the WWWF, becoming a regular in the promotion. There, Calhoun teamed with Tony Garea to form a powerful tag team, winning the WWWF Tag Team Championship. 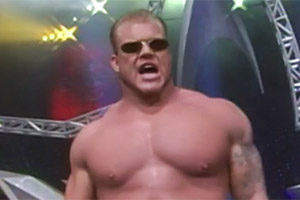 Calhoun continued wrestling there, both in singles and tag team action. 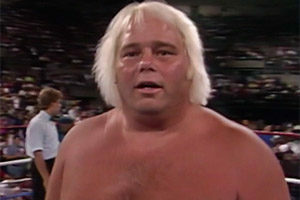 While Haystacks worked a lengthy and successful career, his weight began to catch up with him, aggravating the heavy wear and tear all wrestlers suffer. Calhoun retired in the late 1970’s and tragically, his health problems only worsened. Calhoun battled diabetes unsuccessfully, losing his left leg in 1986. Although Calhoun had a spectacular career, he was impoverished and confined to a double-wide mobile home in his final years. On December 7, 1989, Calhoun died at age 55. He is buried at Scott Cemetery in McKinney, Texas. Haystacks Calhoun’s contribution to the wrestling world was honored with a 2017 induction into the WWE Hall of Fame’s Legacy Class. What are your favorite memories of Haystacks Calhoun? Leave them in the comments section below.